I always thought Brexit would create more political problems for Ireland and Europe than economic ones. All the forecasts of economic 'doom and gloom' that appear to accompany every change the Establishment disapproves of tend to turn out wrong. I am afraid the consensus of economic experts has an extraordinary record of getting big practical issues horrendously wrong. The UK has just made a momentous decision that is bound to cause some dislocation. In 1931, the UK was forced off the Gold Standard. The economic establishment warned that this would be disastrous. Instead, it ushered in the fastest period of growth in our industrial history. In 1992 the establishment warned that we had to stay in the European Exchange Rate Mechanism (ERM) or catastrophe would be unleashed. We were forced out and the economy blossomed. In the late 1990s we were warned by Uncle Tom Cobley and all that we must join the euro – or else. We didn’t – thank goodness – and we prospered. The weight of academic and establishment economists did not foresee “the death of inflation” or the financial crisis of 2008/9. A prolonged period of modesty from them would be appropriate. That's not to say it will be an easy economic ride for Ireland - but what if Brexit turns out to be good not just for the British economy but for ours as well? I think the reverse about the prospect of a President Trump, by the way. While the commentariat are focused on the politics (and the name calling), it's the economic impact of Trump in the White House that should concern us most. A President who wants to Make America Great Again will insist on all those 'tax shy' American companies we currently host on this fair island returning to their homeland - or else. I'd suggest the next time Trump offers to visit us that our Taoiseach join him for a round of golf rather than indulging in leftist virtue signalling in the Dáil. One forecast I am certain of: we'll need all the friends we can get in the turbulent years ahead. As with most historic moments there's a tendency to view things as 'the end of the world as we know it'. 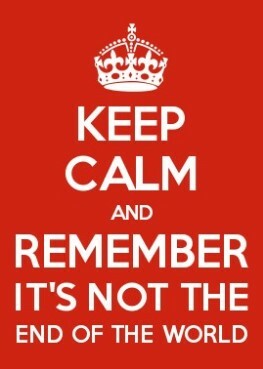 But it isn't: the birds keep singing and the rain keeps raining. But it's certainly the end of something - perhaps the end of globalisation as a political and not just economic force in human affairs for a generation or two. Certainly the forward march of the European Union has been halted. But again, it's too early to tell, as it is with most things Brexit-related right now. Q. 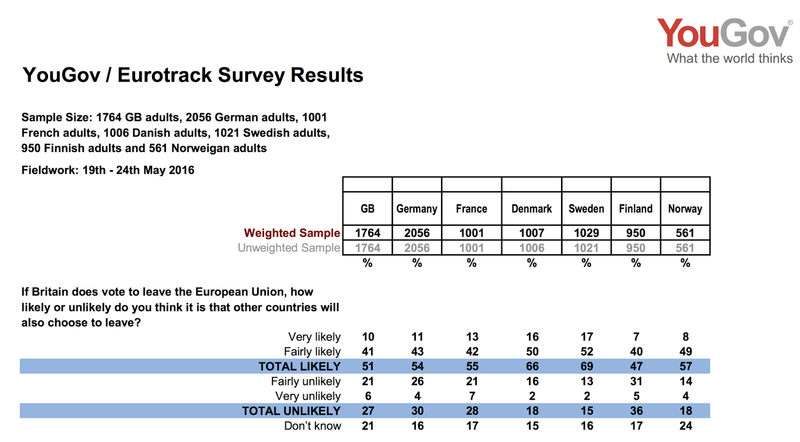 Please tell me if you have a very favorable, somwhat favorable, somewhat unfavorable or very unfavorable opinion of the European Union? Not surprisingly, Greece is least favourably disposed towards the EU right now. But the big surprise is France - they are even less favourably disposed than the British (as I noted before). Nevertheless, the trend is quite stark: in every single EU country for which there is trend data the % unfavourably disposed towards the European Union has risen sharply in the past ten years. There's no need to panic just yet, but there's no excuse for complacency either. 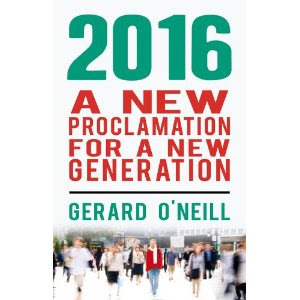 Whilst things have taken an interesting turn across the Irish Sea (Peter Hitchens speculates the UK may have an early general election and even a constitutional crisis if there's a narrow win for Leave), it's what's happening across the English Channel that may matter even more to Europe's future (and Ireland's, come to think of it). Yet another fascinating poll from YouGov, this time across seven EU countries including the UK, reveals a depth of negativity, pessimism and anger in mainland Europe that certainly took me by surprise. While I had heard about the recent air traffic controllers strike in France (about as seasonal and as welcome as greenfly), I hadn't quite grasped the very, very polarised mood in that country. There's even talk of another French Revolution and civil war. Way worse than greenfly. The YouGov numbers are shocking: more than half of French adults feel their financial situation has worsened in the past 12 months (26% a lot worse), and nearly as many expect the situation to worsen again in the next 12 months (21% a lot worse). 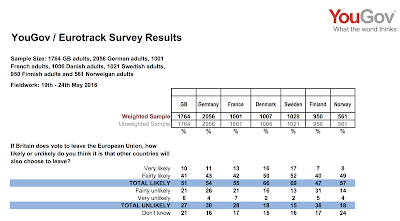 No surprise then that 80% of French people don't approve of their government's record to date, but maybe more surprising is that the Swedish, Germans, Finns and Danes aren't that far behind in their disapproval ratings either. But back to France, what is going on? I recently read Michel Houellebecq's novel Submission - set in France's near future, 2022 to be precise - which paints a fictional picture of a country, even an entire civilisation, undergoing seismic shifts as a result of economic, social, cultural and religion strife. The focus is on the interplay between Islam and Laicité (France is reckoned to have the largest Muslim population in Europe, though it refuses to capture information about religion in its censuses). Unlike his sometime rival Tariq Ramadan, Ben Abbes had kept his distance from the anti-capitalist left. He understood that the pro-growth right had won the ‘war of ideas’, that young people today had become entrepreneurs, and that no one saw any alternative to the free market. But his real stroke of genius was to grasp that elections would no longer be about the economy, but about values, and that here, too, the right was about to win the ‘war of ideas’ without a fight. Whereas Ramadan presented sharia as forward-looking, even revolutionary, Ben Abbes restored its reassuring, traditional value - with a perfume of exoticism that made it all the more attractive. When he campaigned on family values, traditional morality and, by extension, patriarchy, an avenue opened up to him that neither the conservatives nor the National Front could take without being called reactionaries or even fascists by the last of the soixante-huitards, those progressive mummified corpses - extinct in the wider world - who managed to hang on the citadels of the media, still cursing the evil of the times and the toxic atmosphere of the country. Only Ben Abbes was spared. The left, paralysed by his multi-cultural background, had never been able to fight him, or so much as mention his name. France still has its soixante-huitards, of course, and no doubt they're active in the current discontent gripping the country. But the mood now gripping Europe - angry, anti-establishment and open to radical change - isn't confined to 'mummified corpses' and it certainly won't go away after the 23rd June. It's going to be a long hot summer in Europe, though hopefully without the greenfly. It's a huge poll - sample of 3,495 - and the detailed tables that accompany the article are fascinating (for those of us into that sort-of-thing). First of all, it isn't the British who will vote to leave, it's the English living outside of London. 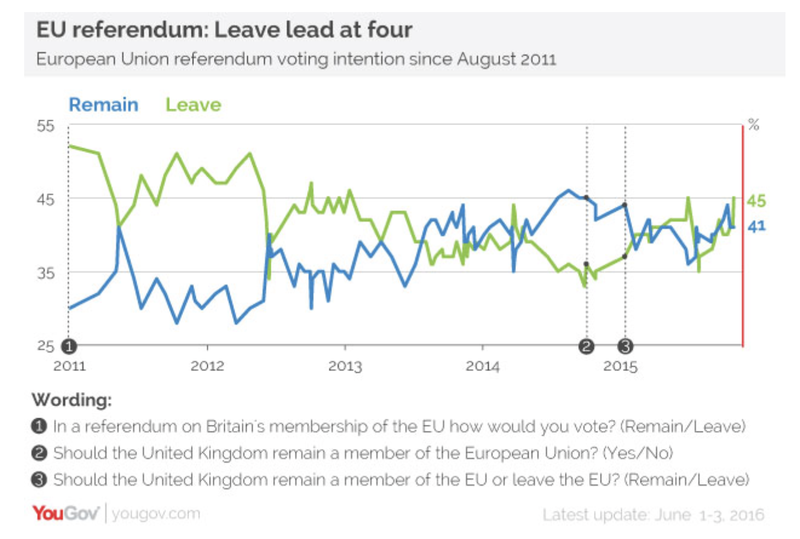 Moreover, I haven't seen such a stark generational divide in a set of opinion polls in a very long time: the majority of 18-25 year olds want to remain in the EU; the majority of those over 50 want to leave. 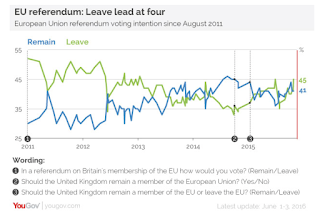 Both men and women are more likely to vote Leave than Remain, but more women are undecided than men (not unusual at this stage in an election/referendum). So the women will be decisive (as they were in the Scottish Referendum). One of the many famous moments of sporting history that the recently departed Muhammad “The Greatest” Ali was associated with was the “Rope-a-Dope” tactic, deployed against George Foreman during the “Rumble in the Jungle” bout in 1974. Foreman hammered Ali relentlessly for almost the entire fight. Ali stayed on the ropes absorbing the punishment, countering just enough to avoid a technical knockout. Everyone thought Ali was finished, and even his own corner, ignorant of his plans, despaired. Late in the fight, Ali stormed out and took the initiative against a shocked Foreman, who was by this time too exhausted to change tactics. Something similar seems to have happened with the EU referendum campaign. 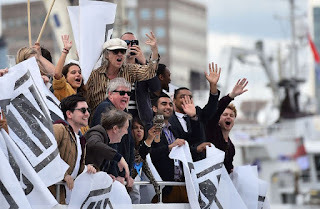 The tactics of the Remainers were plainly to bludgeon the Leavers on the economy, supplying a blizzard of statistics (mostly false) and a line-up of heavyweight international figures all singing from the Remain hymn sheet. By this time, it was supposed to be all over: a dazed and confused Leave campaign would be on the ropes, still standing in name only. It's going to go all the way to 12 rounds, and boy is it going to be a thriller.